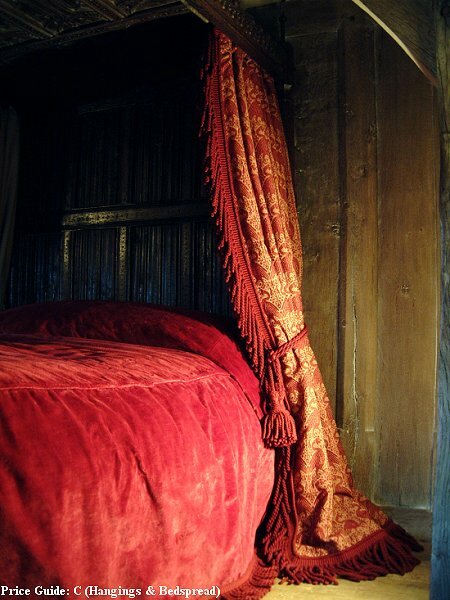 4-POSTER BED. Called Medieval Swans (in Old Gold/Cherry), the pure wool hangings are from a design of fabric made from the 14th century in Italy. They are lined with natural loom-state linen union, with a further interlining of cotton bump, and trimmed with pure wool tassle tie backs and bullion fringes. The bedspread of linen velvet is lined with 100% red linen, interlined with cotton and finished with a smaller bullion fringe. Almost all of this project was hand sewn. The curtains are hung from simple wrought iron rings and rails.